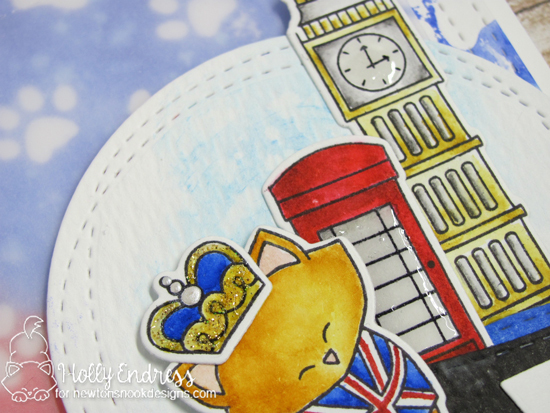 Today Newton is traveling to London with this adorable card by Holly! She used that cute image of Newton wearing a British flag t-shirt along with the phone booth and Big Ben from our Newton Dreams of London Stamp Set! She colored these images, adding some awesome glossy accents and glitter too and then trimmed them out using the coordinating Newton Dreams of London Die Set. To create the scene she also used the curved hill shape from the Land Borders Die Set. Then she set the whole scene in a circle and added the "'ello" sentiment from the Newton Dreams of London Stamp Set in a little banner. For the card base Holly created an awesome background to coordinate with the British flag colors using red and blue inks with our new Pawprints Stencil! How cool is that! I love the way the colors coordinate! Thank you, Holly, for the beautiful card today! You can find more of Holly's creations and say hello to her over at her blog, Hollybeary Creations or visit her YouTube Channel for more fun videos! Wow! It looks really awesome!! !